What Presenter Species Are You? Throughout my career I have attended many public and private events, listened to many business, technology and product presentations, and seen many good and even more not-so-good storytellers in action. In Dutch language, we have an expression that says “elke vogel zingt zoals hij gebekt is,” which translates literally to “every bird sings the way it is beaked.” The same counts without any doubt for public presenters, as each individual speaker has its particular style to get his or her message across. Here’s a list with presenter types I have frequently spotted in the field: the Engineer, the Kindergarten Teacher, the Actor, the Philosopher, the Consultant, the Salesman and the Conversationalist. 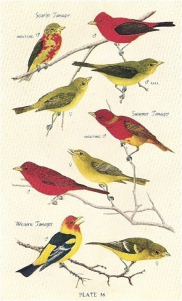 Note that, although I am describing the male specimens, all the species below have a female variant too ― but some of them, e.g. female Engineers or Consultants are quite rare birds. The Kindergarten Teacher is somewhat the opposite of the Engineer. He doesn’t pay attention to (or maybe doesn’t know about…) the details. His performance has all the elements that you may expect from a good storyteller, complete with protagonists/antagonists, a well-built tension and a moral lesson at the end. A kindergarten-style presentation is always nice to listen to, but usually has a bit too little meat on the bone, and at the end of the talk you still feel hungry for the real stuff. The Actor’s main goal it to deliver a dazzling show. A well written story, attractive visuals, and a thoroughly rehearsed speech are key to the success of his performance. We all know that practice makes perfect, but over-rehearsal can also kill your presentation. Overall, the Actor is a great performer on stage, but he’s frequently lacking spontaneity, and will often make a poor appearance when the audience starts asking questions. The Philosopher tends to introduce high-level concepts, ideas or solution schemes. His visuals contain lots of boxes, arrows and clouds. Although his content may be called abstract, holistic or even esoteric, and his talks are frequently lacking a clear structure ― the Engineer would rather call them fluffy ― a Philosopher’s presentation is often well received by corporate strategists. If you have these in your audience, they might be looking for visionary material and food for thought, rather than for the Engineer’s precooked product and solution bites. The Consultant also puts up lots of slides with boxes, arrows and clouds, but that’s mainly because these graphic elements are prescribed by his employer’s PowerPoint template. And you can bet on it that he’s added lots of numbers, tables and charts too, to make his proposition (look) concrete. Don’t expect him to come up with an entertaining story, because being perceived as a storyteller is exactly what (most) Consultants try to avoid at all times. The Salesman doesn’t really care about the story ― and, unfortunately, sometimes not even about the accuracy of the content. Real business is done before and after — not during — a presentation. His slides are generally “off the shelf”, his messages pushy, and his tone not adapted to the audience’s expectations and needs. As they are rather centered on offer than on demand, Salesmen tend to be bad listeners too. As an example, rewatch the video sketch that I included in my “One mouth and two ears” post on this blog. The Conversationalist’s presentation thrives on interaction with the people in the room. You may recognize one when a speaker starts his talk with an open question or a personal anecdote, and has his Twitter ID or his LinkedIn URL mentioned on the title slide. The Conversationalist welcomes interruptions, but then unfortunately regularly enters into discussion with (a few members of) his audience, gets carried away from his presentation topic or story line, and will probably not manage to finish his speech on time. And of course, a Conversationalist loves to continue the conversation during the break. The list above is neither intended to be exhaustive nor prescriptive. If you have encountered a storyteller with a presentation style that does not match one of the types (or a combination thereof) in the list, or if you are a unique-beaked species yourself, please share it with the readers of this blog through the “leave a reply” box below. This article was syndicated from Business 2 Community: What Presenter Species Are You?